While the larger issue of watershed development in Napa County is discussed on the Watershed Issues page of this site, I have broken out the specific concerns of the Rector Watershed here. This is a satellite view of Upper Soda Canyon Road as it existed in 2014 (click on it to enlarge). 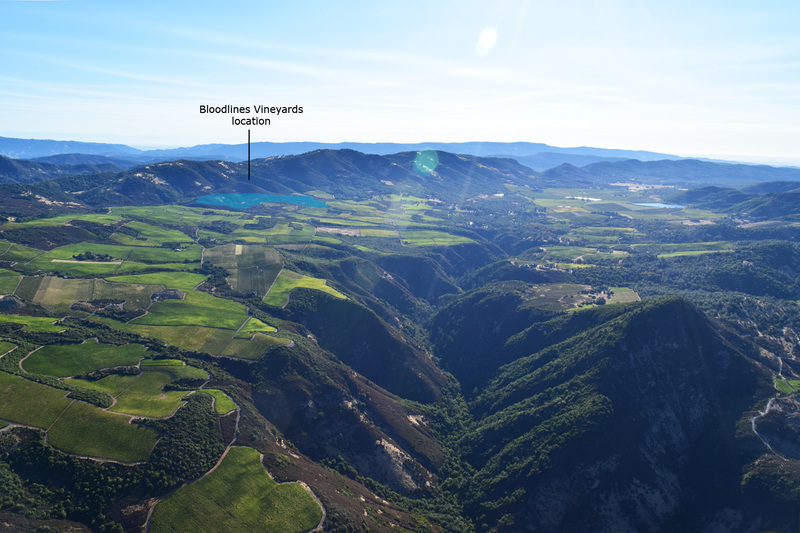 The photo shows most of the watershed for Rector Reservoir at the edge of the Napa Valley providing water for the Yountville Veterans home and the town of Yountville. A vast amount of vineyard development has occurred on Soda Canyon Road in the 22 years since Mui and I first arrived. 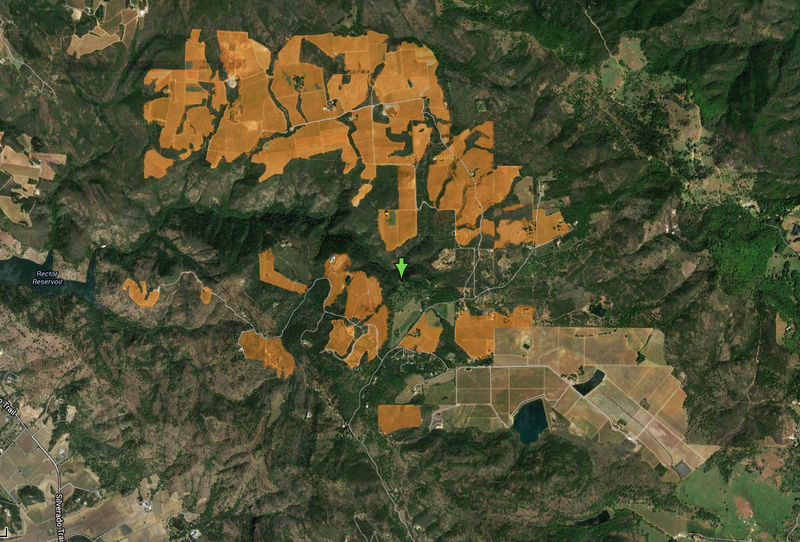 The orange areas represent undeveloped land converted to vineyards in that time. Several newly cleared areas do not yet show up. 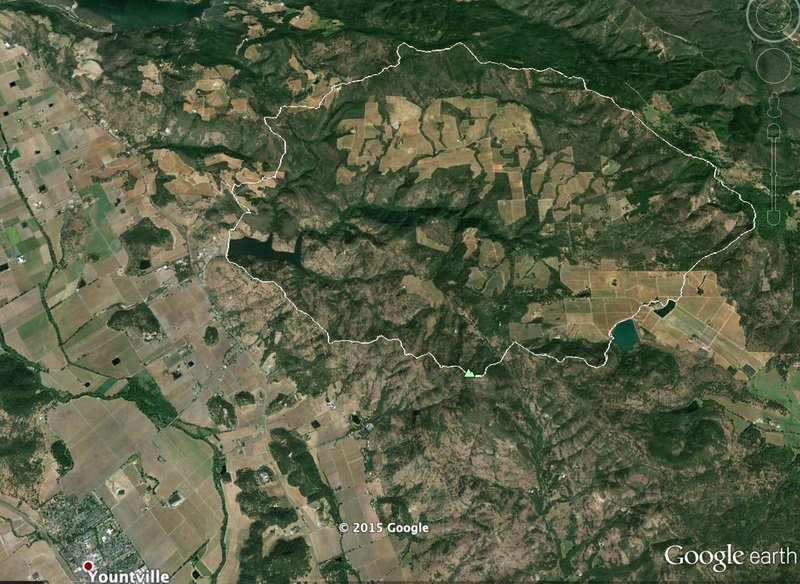 It is the most heavily developed watershed in Napa County, probably by a wide margin. Look at all of the watersheds area now on Google maps satellite view - due to vineyard conversion in the last 20 years, the hills on each side of the valley now resemble the deforested amazon or Vietnam after the war. 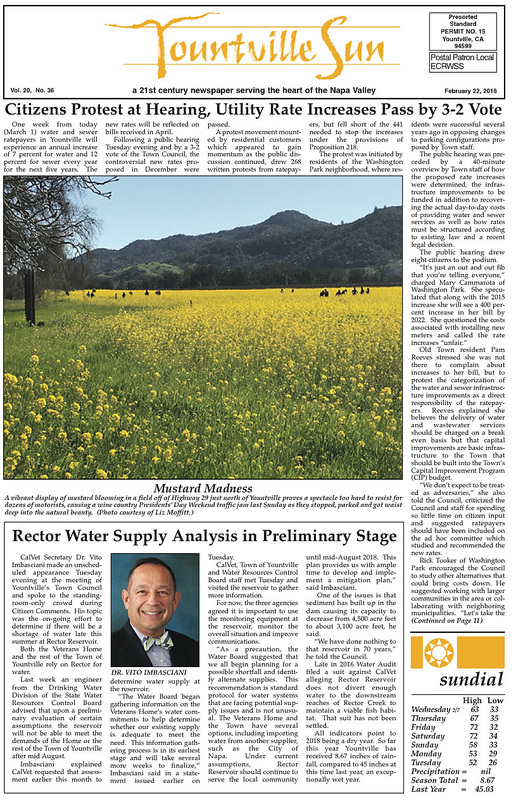 If left to currenty county policies, the entire Napa watershed areas risk being developed to the extent that Rector has been. The big question is whether vineyard and winery development on this scale, and within the context of an ever warming climate, will have an affect on the resources that make agriculture in Napa possible. The towns of the Napa Valley are dependent on a few relatively small watersheds for their drinking water. The question now is whether development of the Rector Watershed, raised first in the case of Walt Ranch in regard to Napa City's Milliken Reservoir, will have an impact on quantity and quality of the drinking water that the town of Yountville and the Veterans's Home depend on. The issue of siltation became very real in the 1990's at the time of the initial development of Stagecoach Vineyards, with damage to the reservoirs pumps and expensive repairs required. In an era of global warming and of increasing concern about the impact of ever more agricultural chemicals in groundwater, protection of water sources needs much more scrutiny. There are, of course, also traffic impacts: the tending of all those vines takes thousands of workers driving each day to the most remote corners of the valley before retiring to their homes much further south. The worker caravan on Soda Canyon Road can now reach 50 cars, with more vineyards continuing to be developed. Yet those impacts, which are of such a concern when it comes to any other form of land development, are seldom mentioned in the discussion of vineyard conversions. Yountville Sun 2/14/18: Rector dam water could run out in Aug. The initial scare last year over a water shortage was probably caused by the conditions of this 2017 lawsuit brought by lawyer William McKinnon representing Water Audit California against the administrators of the Rector Reservoir for failing to provide enough water release to Rector Creek below the dam to maintain fish populations. Its conditions were to be enforced beginning in May 2018. It is one of numerous lawsuits Water Audit California has pursued against dams, including Bell Canyon, Kimball, Milliken, and Hennessy for failing to release enough water for fish habitat protected by California law. The lawsuit is here. It contains some of the most extensive documentation and analysis of the conditions the Rector water system available. 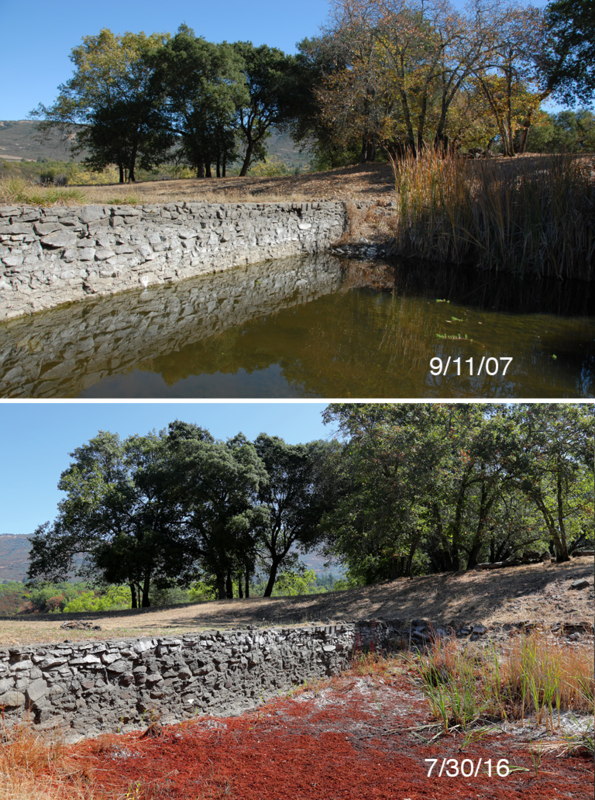 The subsequent article in the Yountville Sun notes that siltation has decreased the volume of Rector Reservoir from 4500 to 3100 acre feet in the last 70 years. Which means that in addition to the potential loss of spring water into the reservoir from groundwater pumping for vineyards, that siltation from the creation of those vineyards since the 1980's (1500 acres) is reducing the capacity of the reservoir and the water available for use. Which also means that it takes an ever diminishing amount of water to fill the reservoir each year, giving a false sense that agricultural development and a warming climate have not had an impact on water levels. The siltation shown in the photo in this post from last year is from a vineyard re-planting a bit up from the road crossing. Again Rector Reservoir, given the high ratio of vineyard acerage to watershed area is proving to be an interesting indicator of the potential effects of ongoing vineyard development in the other watersheds of the county. This story just keeps getting more interesting. 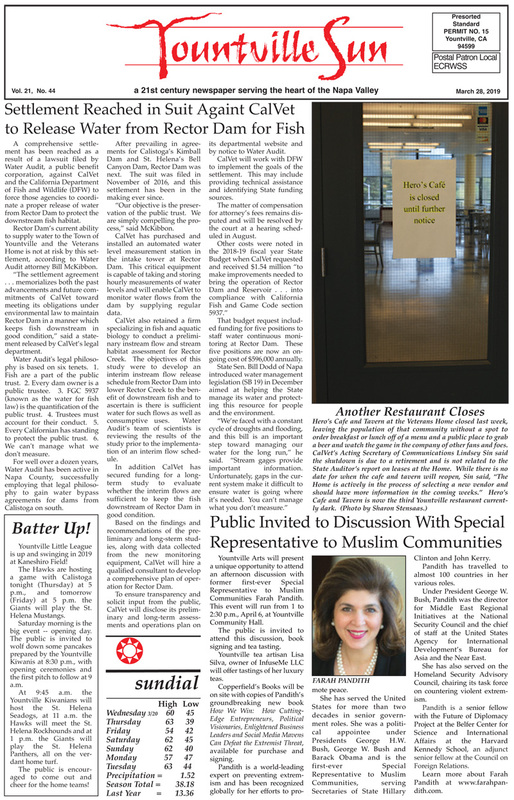 An article in this week's Yountville Sun was pretty arresting: "Rector Dam water could Run out in Aug". I was both surprised, and, given concerns over climate change and the enormous amount of ground water being sucked out of the Rector watershed for vineyard development in the last 25 years, not surprised. The prospect of Rector going dry, if indeed that is the case, will raise a couple of questions: What impact is vineyard development in the watersheds going to have on water availability, both surface and groundwater, as climate change happens. When it comes to apportioning water for residents, agriculture or tourism who gets preference? 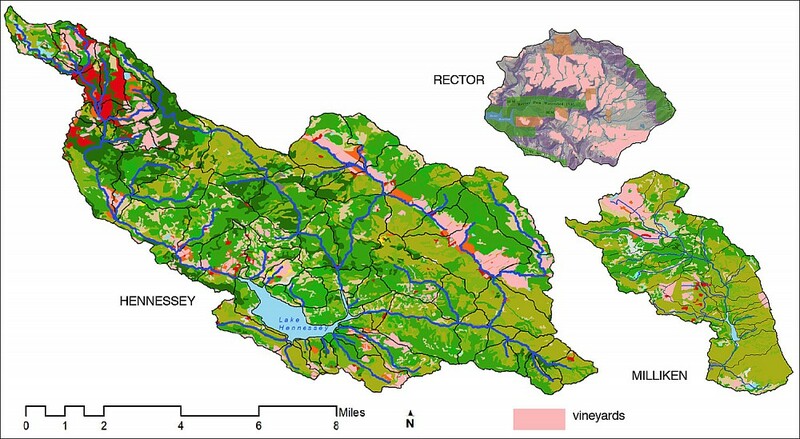 The Rector watershed is the most heavily cultivated of Napa's 5 watersheds with approximately 21% of its surface area in vines. The amount of ground water being pumped must be enormous. Does that pumping result in lower levels in the Rector Reservoir? Ground water and surface water are an integrated system, each impacting the other. 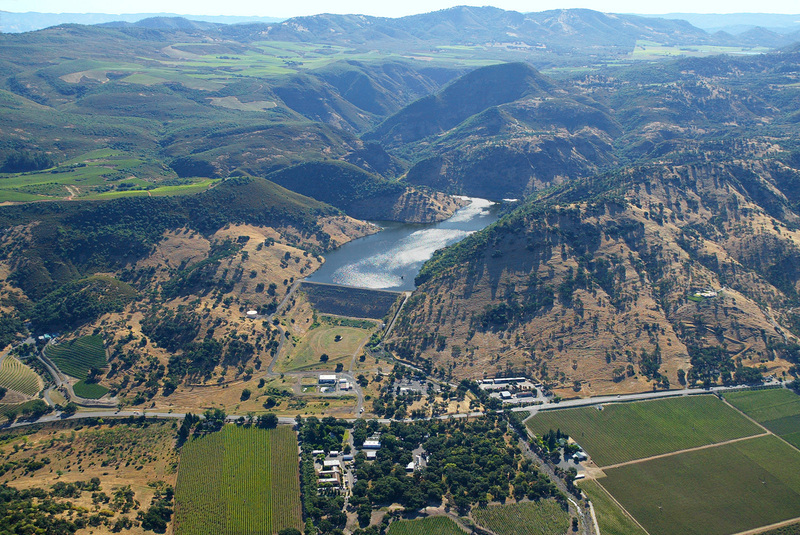 The Rector Reservoir is over 1000' below the vineyards on the watershed and is undoubtedly augmented with the water of numerous springs from the sides of its steep canyon. While vineyard developer's consultants may try to make a case otherwise, the decreasing water table created by groundwater pumping undoubtedly contributes to a reduction in water reaching the reservoir. The water table is falling on the Rector plateau - I know that from changes in the water level of our spring-fed pond which no longer overflows into the canyon each winter and now dries up completely in the summer. Whether from less rainfall or from increased ground water pumping is impossible to say. Both have been happening since we moved there 25 years ago. I have always felt that the Rector watershed, given the acerage of vines that cover it, should be a test case for all of Napa's watersheds, illustrating how continued development of the watershed for vineyard use will ultimately impact the water all Napans rely on. The fact that it is the first water supply experiencing the possibility of drying up, should be of concern to all. 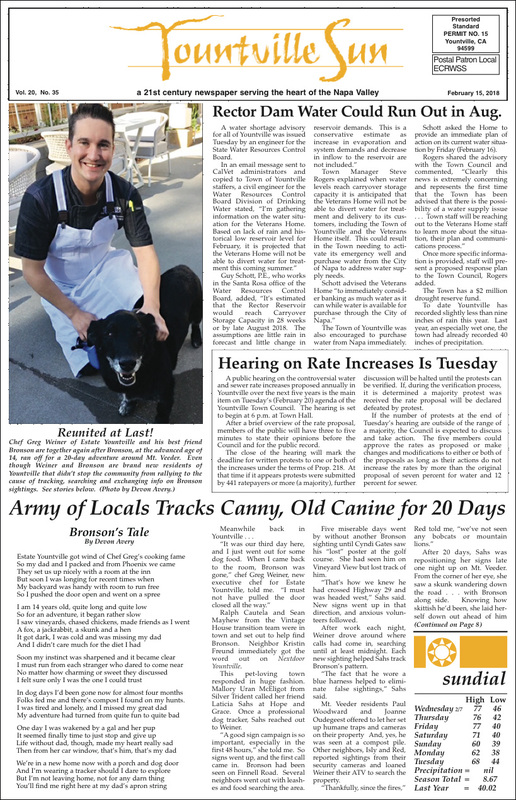 On the same page of the Yountville Sun, there is an article about a proposed rate hike for water and sewer services in the town. (The city of Yountville gets its water from Rector Reservoir, under contract from the State Dept of Veterans Affairs which owns it and the Veterans Home.) In the article and in LTE's in the same issue, there is a great deal of consternation among city residents that they should be asked to pay for the infrastructure costs of water and sewer systems when, as they rightly surmise, it is the continual increase in the tourism population that necessitates the upgrades. The resident population of Yountville has decreased slightly in the last 30 years from 3200 to 3000. By contrast, the hotel population, 460 rooms or so, has increased the daily population by 900 people, almost all since 1990. In addition, the day-tripper population has grown considerably as the valley has exploded into a good-life mass-tourism destination. The amount of water used and sewage generated has increased proportionately. In fact, high-end hotels and restaurants are high water users compared to residences. Residents are right to ask why they should pay. One frustrated resident recommended raising the TOT instead, stoking a huffy response from Visit Napa Valley's Clay Gregory, Napa's official tourism promoter, saying that the costs are fairly prorated based on water use. Which, of course, still means that residents are paying a portion of the costs necessary to accommodate the tourist population. The problems of a drying Rector Reservoir highlight the tradeoffs that all Napans may eventually have to make between residents, growers, wine makers and tourists (as well as fish). In reading an article on the drying up of Cape Town's water one comment struck me: "Letting a well-heeled German tourist use some [water] to rinse beach sand off his bottom probably does more good for the economy than spraying it on a wheat field." At what point will the TOT be prioritized over the vines on the basis of the most profit for the available water? Perhaps not soon. But tourism is definitely a more profitable use of land than agriculture, and a water shortage will only accelerate the transfer from an agriculture to tourism economy. At some point, as I tried to bring out in my bit on Bali's water shortage, tourism and agriculture will be on a collision course over water as they are now over the county�s economic soul. Let see . . . we told the county that Soda Canyon has a long history of devastating wild land fires and that the canyon was over due to burn. And it did. 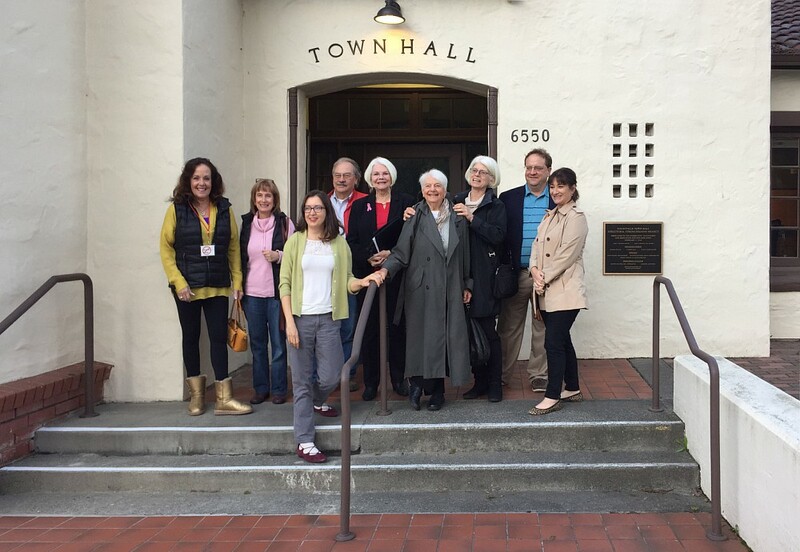 We told the county (and the town of Yountville) that the Rector Watershed was over developed and the continued development threatened the water supply for the town of Yountville and the Vet's Home. And it has. We've also told the county that Soda Canyon Road is dangerous, over burdened, in deplorable condition and that increased tourist/wine visitor traffic on the road makes deadly traffic accidents (i.e. tourist bus plunges into the ravine) much more likely. There is no satisfaction in "I told you so" when the consequences are deadly. One neighbor asked if our well water usage might impact his well water availability. According to our Water Availability Analysis included in the EIR, we will not impact neighbors� water supply as with our deficit irrigation strategy we will use less water than is annually recharged. However, as detailed in the EIR we will monitor neighboring well levels and adjust our well use if we cause impacts to neighbors� wells. The EIR actually determined that water quality will be improved after our project is developed, as we will take engineered measures to prevent sediment runoff. Please reference Section 4.6 Hydrology and Water Quality in the EIR to read details of our mitigation measures to ensure that there are no significant effects on water quality or neighboring water quantity. My brother-in-law was a volunteer firefighter for 13 years, and I can�t thank him enough. My team worked with the Fire Chief of the Soda Canyon Volunteer Fire Department and we provided much needed upgrades to their fire station, including repairing dry rot, replacing the garage doors, repainting the firehouse, and repaving the driveway. If the Department decides that it would benefit from a well and a water storage tank on site, we will set up a timeline to pay for these improvements. We commit to maintaining the building as needed, it is the least that we can do in return for their service. The County has issued the Negative Declaration on the ECP for for the Hendrickson Vineyard, a 29 acre vineyard on a 47 acre parcel, of which, the ND indicates, 10 acres had already been cleared and planted "without the benefit of an approved Agricultural Erosion Control Plan". My team is working with local Neighbors, Board of Supervisors, Mayors, City Council Members and Planning Commissioners and listening to any of their questions or concerns regarding our project. This communication has been valuable, and we are incorporating cooperative solutions into our plans. 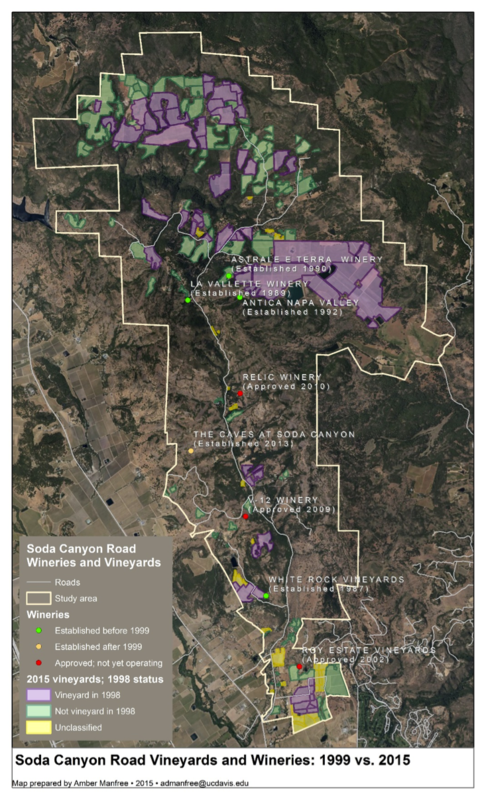 Each expert report, the Erosion Control Plan, and the Environmental Impact Report will be available for your review at the County�s website (https://www.countyofnapa.org/694/Bloodlines-LLC-Soda-Canyon-Vineyard). The official County Public Comment Period will start in mid to late November. If you have any questions or input regarding the application prior to that time, I invite you to contact me directly. My team and I value the opportunity to hear what is important to you. While touring the veterans� home, she saw a sign that said to turn the water faucet on five minutes before drinking the water. It may be rusty pipes. Or possibly some of the 1400 acre feet of silt that has now filled up Rector reservoir most probably from the vineyard creation in the over-developed watershed in the hills above. Please note in the articles that Gallo is considering planting another 100 acres, the same acres, no doubt, that Dr. Krupp decided to back away from in the face of a $220,000 EIR, and the knowledge that someone else would be along shortly to deal with it. If you havent read the book on the Gallo family titled "Blood & Wine," (https://www.amazon.com/Blood-Wine-Unauthorized-Story-Empire/dp/0671649868), I strongly encourage you to do so. In short, if the company is run anything like it was when Ernest and Julio Gallo were involved, this is VERY BAD NEWS for SCR. If MPV makes it through, you can guarantee Gallo will be next in line for a big visitation center. At the Yountville City Council on Mar 21st, 2017, the residents of Soda Canyon Road presented a white paper on the dangers of the potential pollution of Rector Creek and Rector Reservoir caused by the construction of the Mountain Peak project. The project envisions moving massive amounts of earth around on a constrained site bordering one blue line tributary to the reservoir and bisected by another. The construction calls for 29,500 cubic yards of cave spoils, another 19,000 cy of other excavation, the removal of approx 7 acres of topsoil so that the excavated spoils can be distributed on the site and then the recovering of the spoils with the topsoil (calculations here). The excavated crushpad, through which all of the cave excavation must be moved, is within 100 ft of Rector tributary. A major fill area, comprising 2 acres of soil removal, placement of spoils and redistribution of topsoil, is just adjacent the tributary that bisects the site. A second area of fill surrounds a wetlands area of the site that also drains within a few hundred feet into the canyon. The environmental concerns are obvious. Silting from vineyard development in the Rector watershed in the 1990's caused damage to the Rector Reservoir filtration system resulting in millions of dollars in repairs. The county should be requiring Environmental Impact Reports (EIR's) to assess similar impacts on this project and other land clearing projects now going on in the watershed. The Mountain Peak project, with only a negative declaration of environmental impacts, was approved by the Napa County Planning Commission on a 3-1 vote at the beginning of 2017 and an appeal of the decision to the Napa Board of Supervisors was later denied. The BOS decision will now be challenged in court. An EIR should be required. Cover photo from the "Rector Creek Reservoir Watershed Sanitary Survey 2009 Update"
Thank you for taking my call on Monday regarding Rector Creek water quality. As I mentioned, I hiked a portion of the creek last Saturday and was dismayed to see more sediment than usual in both the mainstem and largest tributary to Rector Canyon. Having been raised in the Foss Valley area, I have hiked the creek nearly every year for the past 20 years and am intimately familiar with conditions there. My first hike was in 1989, and my family has been making treks there since the 1950s. I am attaching photos labeled with dates for comparison. The 2016 and 1998 photos show poor conditions while the other dates show what it looks like under better summer/fall conditions. Since vineyard conversion, there is always some fine sediment present. Before that, and in side channels with more intact watersheds, the water is crystal clear. My memories of the deeper pools from the early 1990s are of water like glass, where the bottom was clear, bright, and sediment-free at 12+ feet. Compared to many systems, the sediment shown may not seem out of hand but it's the thickest coat of fine sediment I have ever seen in Rector, even exceeding the 1998 sediment load, which previously held the record in my observations (photos attached). Unlike 1998, sediment is heavy in two, not one, branches of the creek. The Rector drainage now has about 1,500 acres of vineyard, essentially all converted from wildland over the past 25 years. As a resident, my observation is that the County does a poor job of ensuring compliance in this remote "out-of-sight, out-of-mind" valley, and the county planning department doesn't have a sense of the big picture, cumulative impacts that are happening. 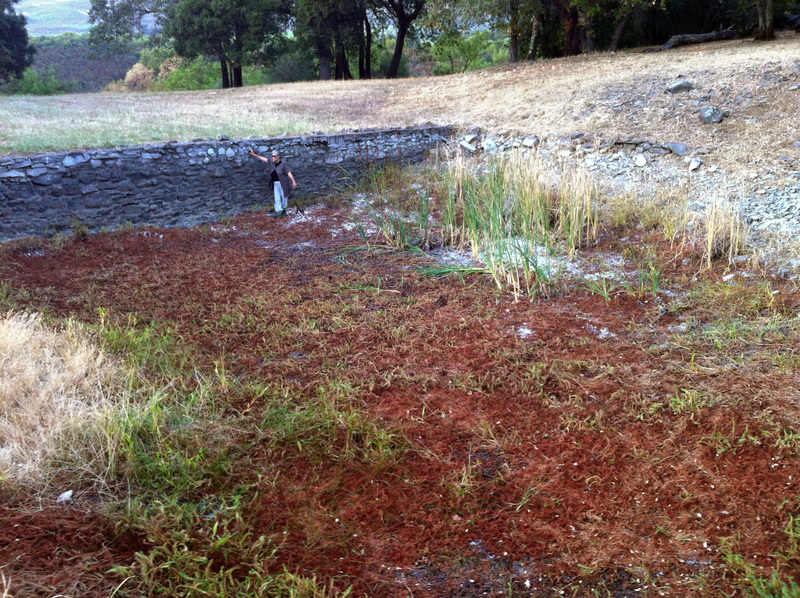 I am writing primarily to alert you of this possible water quality concern related to sediment loads, of immediate interest to the City of Yountville. The status of much of Rector Canyon as a designated wildlife area is also a concern. Based on my long-term observations, my sense is that the riparian system is at a tipping point - particularly because of the new and persistent presence of invasives, which indicate warmer and steadily lower-quality conditions. Invasive aquatic species including bullfrog, green sunfish, and largemouth bass have all made their first appearance in the Canyon proper in the past 6 years. If the County keeps approving every proposal, the high quality habitat that still exists in Rector Creek will slip away. Rector Creek presently supports robust populations of rainbow trout and foothill yellow legged frog. The most alarming proposal at this time is for a 100,000 gallon winery with 15,600+ tourists/year at "the mailboxes" on upper Soda Canyon. Most residents are concerned about noise and traffic that would be caused by the Mountain Peak project, but there will also be substantial impacts to Rector Creek if this project is approved. The winery would operate within 33,000 square feet of caves, and all of the material excavated will be placed just outside the required stream setback along two blueline creeks. The project managers literally bulldozed a road through one of the creekbeds already, so I am not eager to find out how they manage cave spoils. Moreover, if this project goes through, it will set a precedent for the Rector watershed in terms of scale, scope, and marketing plan, and more of the same will likely follow. The City of Napa recently weighed in on the Walt Ranch proposal in the Milliken drainage (attached PDF), and I hope the City of Yountville might consider doing the same for the Mountain Peak proposal. Napa County's Mountain Peak project page is here. I know this is a long email, so thank you for taking the time to consider this information. As water managers, I strongly encourage you to see the entire length of the creek firsthand. If you ever would like to hike Rector Creek from the top down, please let me know; I am always happy to guide intrepid adventurers. My concentration on this website has been on the impacts that continued urban development is having to all of us living in Napa County. I haven't spent a lot of time in public comments on the specific impacts that the Mountain Peak project next door, the fountainhead of all my angst over the future of the county, will have on our lives. But I will do so here because it is a modest example of the larger issue of water depletion in the watersheds that we first heard about on Woolls Ranch, and in many of the watershed projects coming before the county in the last 2 and a half years. Upon our return from a 3 week hiatus on July 15th we discovered two new occurrences on our Napa property. 1. Another oak had fallen dead, the second this year in addition to one major limb lost. This brought to 6 the number of oaks within a 200' radius of our pond that have died in the last 10 years, with the one large valley oak adjacent the pond on its last legs (roots?). 2. The spring-fed pond had dried up completely for the first time in our 22 years here. To be sure, for the last 10 years the surface of the pond at the end September has been getting lower and lower. But this year by mid-July it had dried up completely - hard dry. I have probably been less concerned than I should have in the diminishing water level over the 10 years. It has been a period of drought. I should have been especially concerned over the last 2 years knowing that a large winery was being planned next door. It was not until I was staring at the completely dry hole that I thought, this could be serious. Our property is surrounded on 3 sides by a gorge. The fourth is our property line with the Mountain Peak project. Any water that makes its way to our spring and to the 100' deep well just adjacent to it has to pass under the Mountain Peak site. They are planning to add a second well on the property. How much more will they be pumping to accomodate a 100,000 gal winery, 80-100 visitors and 19-27 employees per day? The water availability analysis for the project indicates they will be using less than is currently used. No amount of number crunching will convince me of that. The current irrigation on the Mountain Peak site is probably not a whole lot more than it was 20 years ago (although a portion of the site was replanted in narrow rows thus increasing water use). There are some low areas of the site that may have had drainage lines put in which may have diverted the water table that feeds the spring. Just as important, many more vines have been planted uphill from us in the last 20 years in addition to Mountain Peak. And, although last winter's rains should have done something to improve near surface springs, the drought is still with us. Whatever the cause, extracting more water from the area has to be considered a reasonably foreseeable contribution to an already ominous situation for our continued water availability. Our pond and the dying trees may not rise to the level of a canary in the coal mine when it comes to changes in water availability in the eastern watershed. But it is a real example of a water source drying up. As such, in an era of global warming and continued exploitation of groundwater for ever more agricultural and urban development, it is an occurrence worth noting. 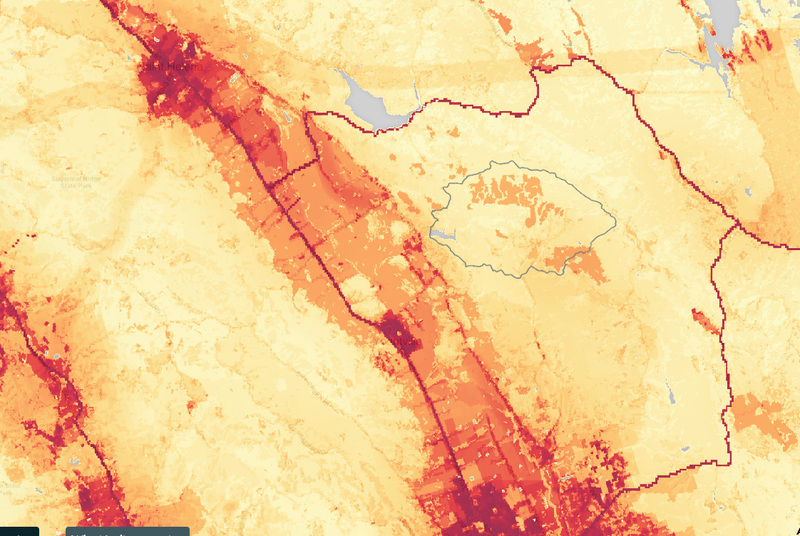 This screenshot of local urbanization from the The Disappearing West mapping project shows the Napa Valley from Napa to St. Helena. It is interesting to note the development of the Rector watershed due north of Napa city (the entire watershed is outlined) in comparison to the hillside areas in the rest of the watersheds on each side of the valley. 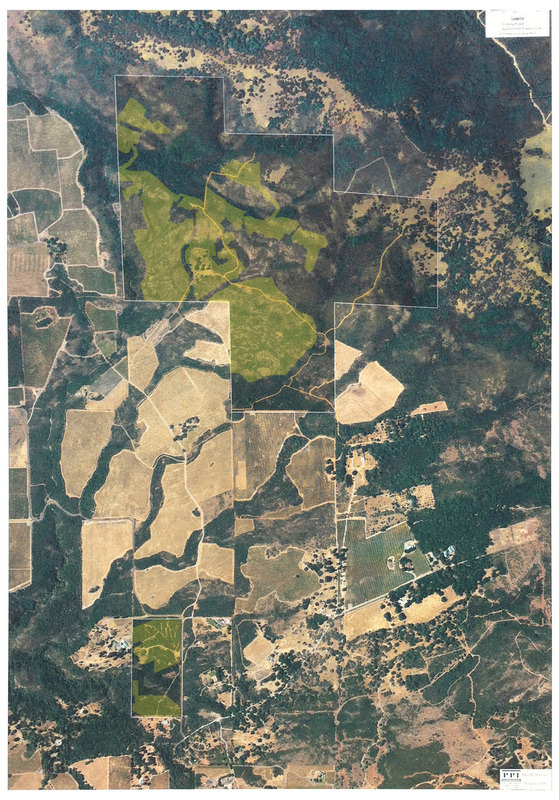 The only other area of comparable vineyard development is the flatland of Wooden Valley in the lower right. There are clear-cuttings going on all over the watersheds, of course, but they have yet to join up into the massive visible deforestation evident here on the Rector plateau. They will eventually, however, if county policies remain as they are and the plutocrats needing a winery of their own continue to arrive. Update 6/10/16: the night sky is disappearing along with the West. 80% of Americans can no longer see the Milky Way. We on Soda Canyon are among the 20% whose sky has not become so polluted that the Milky Way is no longer visible, but probably not for long. Note in the article that Sedona, Ariz. has become an international dark sky area - it is possible to stop the pollution if communities and their governments have the will. On Dec 16th 2015 County Planning Dir. Morrison asked the BOS for the money ($220,000) to hire a consultant to write an EIR for a proposed 116 acre vineyard conversion by Stagecoach Vineyards in the Rector watershed. The notice of the pending ECP has shed a light on the watershed, perhaps the most heavily developed in the county. There are 3 other pending ECPs amounting to 260 acres of development [Stagecoach was pulled so as of 8/16 we are down to 145 new acres proposed], the realization of which encouraged me to express concern to Dir. Morrison. I had long assumed that the Rector watershed had reached its development limit. I was wrong. Opposition to the proposed vineyard development of the Walt Ranch, and the drought, has begun a discussion in the county about the value of watersheds and the woodlands that cover them in maintaining the water resource necessary for agriculture and for municipal water supplies. That discussion is documented on the SCR Walt Ranch page and on the posts on this page. Rector, given its compact size, sole source for the domestic water supply of the the Veterans Home and Yountville, and the extensive amount of development having taken place, may make it a case study in the future development of the other watersheds in the county. Stagecoach Vineyards currently comprises about 650 acres of vineyards (much of the area north of Rector gorge in the photo at the top of this page). The project was begun with a mile and half access road built in 1996 and then the first clearing and vineyard in 1997. This late 90's phase of the Rector development was overlooked in the 2002 James Conaway book that documents the problems that hillside clearing was continuing to cause despite the conservation regulations enacted by the county in 1991. It is unfortunate - more vineyards were probably being developed on the Rector plateau at the time than anywhere else in the county. And perhaps causing significant erosion problems. From my house near the end of Soda Canyon Road I have a clear view of the sides of Rector Canyon just below the Stagecoach vineyards, and I did notice 2 new runoff gullies at some point in the first years of our residence. They are still visible. We took up residence in 1995. Jan Krupp has pulled his application for an additional 116 acre expansion of the Stagecoach Vineyards. This was probably not the best time given both the current political climate and the current real climate to push the boundaries of rector watershed development, and I think most of his neighbors applaud him for the decision. I was also informed that the Antica ECP is technically a replant of existing vineyards and will exclude it from the tally of additional vineyard conversion on the Rector plateau. We are currently at 142 acres to be converted in the next couple of years. 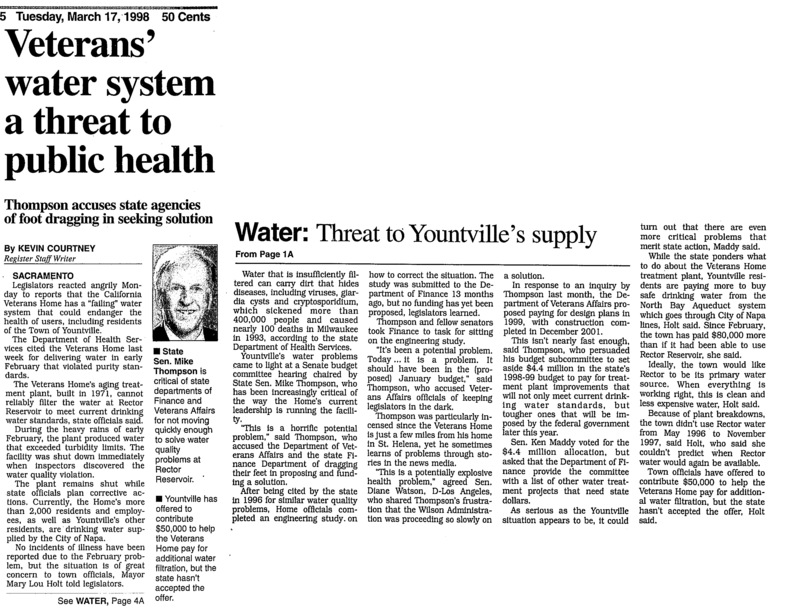 NVR 5/17/1998: Veterans water system a threat to public health. Diane and I live within the Rector Watershed and we have also questioned the explosion of vineyard development in this area. I would like you to be aware that another problematic business exists which is located on the Stagecoach property, a stone and gravel business with rock crushing machines and which involves a continuous cadre of trucks ferrying the material up and down Soda Canyon road. I do not know if they quarry the stone or if the stone is residue from the excavation of vineyard clearing and/or if the are required to have a permit since the rock and gravel site is within the Rector watershed. Is there a water use for the rock and gravel business? As with SYAR is an EIR required for a rock and gravel business, particularly within a sensitive watershed? Are there safeguards at the gravel and rock site for erosion and sediment that may enter the Rector reservoir? The landscape in the Rector plateau has already lost thousands of oak and other native species due to the expansion of vineyards. The rock and gravel business adds another factor that may impact the reservoir and the water supply for Yountville and the Veterans home. My wife and I live within the Rector Watershed at the top of Soda Canyon road where we have witnessed the rampant development of vineyards. 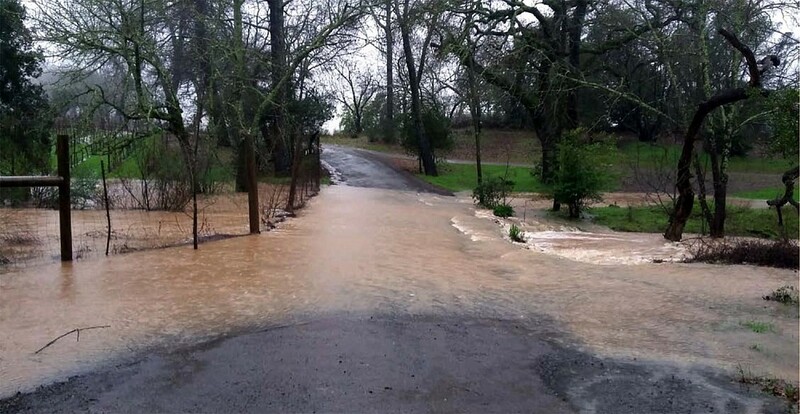 We have questioned the expansion of vineyard permits within the watershed and the possible implications of water depletion and sediment caused by erosion that may drain into the Rector Reservoir water supply for Yountville and the Veteran's Home. and, the elimination of native species, both flora and fauna. Of equal concern regarding decimation of the watershed is the Krupp Brothers, LLC, rock and gravel quarrying business. What kind of permit was issued for this business and was an EIR required as with the SYAR quarry? The 18 wheel transfer trucks that continuously travel the gravel and paved roads of Soda Canyon do considerable damage to the roads. Are there any County plans for future improvements on the road? 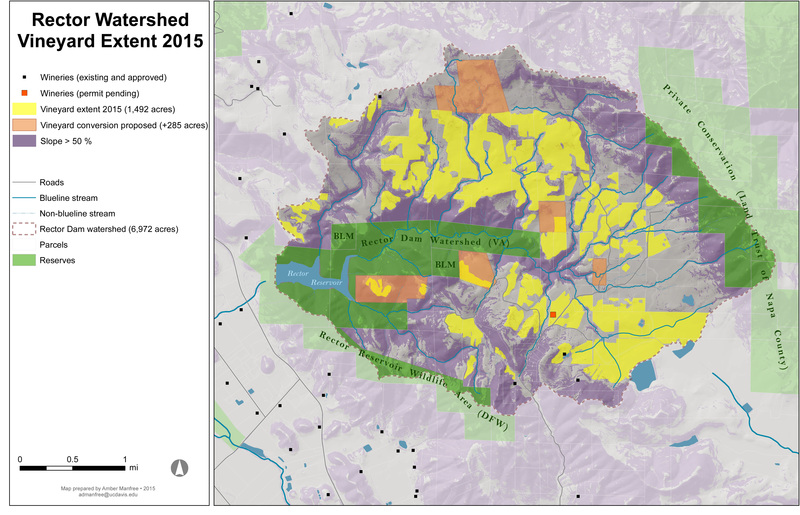 I have attached a map of the Rector Watershed that show the present and proposed future development of this watershed, the most developed watershed in Napa County. An EIR and Erosion Control Plan were approved for the Krupp Brothers project on 10/7/08. The project anticipated the creation of rock as a result of soil preparation as well as the crushing of the rock for purposes of resurfacing and maintaining new and existing roads. Rock pile locations we specified on the plans and are intended to be temporary. It is my understanding that a limited amount of off-hauling of rock is allowed without triggering permit requirements similar to Syar. Regarding impacts to the condition of Soda Canyon road, I can speak with the roads department to see if there are any plans for resurfacing in the near term. Please do not hesitate to contact me with any further questions or concerns you may have. As you mentioned, the Krupp LLC permit allows for rock crushing and the making of gravel to be used on the roads within the Krupp vineyard area. Does the quarrying permit also grant commerce to Krupp LLC? If so, please inform me of the parameters of his permit. If not, then why are his transfer trucks plying loads down Soda Canyon Rd.? That's 260 acres of new vineyard development. That means a lot more new wells. A lot more traffic on a long 1-lane gravel road and on the already problematic Soda Canyon Rd. Below is a Google map image of the Rector watershed. 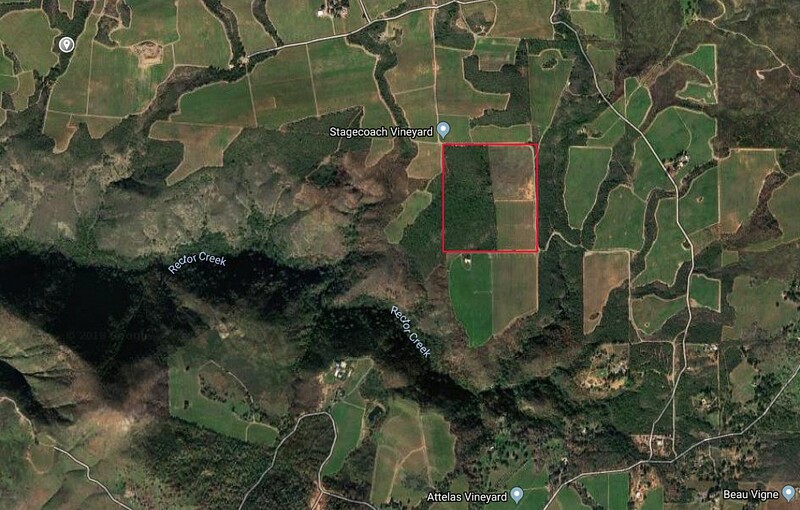 I had felt, looking at the google map, that perhaps vineyard development was reaching a limit on the Rector watershed (the Chopping property just north of Antica is the only large chunk left). If you scroll around on google maps you will see that It is more developed than any other mountain watershed in the county by a wide margin. But apparently development is still going to continue. Is there no concern on the county's part about the impact that such a massive amount of vineyard development in the last 20 years is having on the Rector watershed and on the water supply for Yountville and the Veterans Home? I assume that Rector Reservoir still fills up, but shouldn't someone be doing some studies to verify that it will continue to fill up even as more and more acres are developed? Given the EIR required for Walt Ranch's 500 acres and the EIR required for Circle S's 460 acres, it does seem odd that the Rector watershed has had perhaps a thousand acres added since 1996 (plus the 700 acres developed in the 1980's) and now is planning another 313 acres and that, to my knowledge, no EIR has ever been required. These developments encompass almost the entire Rector watershed. Am I out of line in asking about this? Of course you are not out of line for raising these concerns. These are serious issues and you are relying on observable information. You are correct about the overall pattern of development. Staff has also noticed that the Rector Reservoir watershed has seen the greatest amount of interest in vineyard development over the past 10-15 years. We generally analyze projects with the GIS database and hadn�t looked at an aerial photo comparison. Thank you for passing that along, it was very informative. A couple of notes for clarification. The acreages listed are gross acres, not net acres. They include farm roads, staging areas, and other ancillary uses to the vineyard. The number of proposed planted acres is less than 285 acres. Havenner has already been approved. Please note that further development is proposed to continue. The outcomes of these applications remain to be seen. Not all applications are approved. While the County does not have the ability to legally prohibit people from pursuing what the zoning and General Plan permits, it also cannot guarantee a successful outcome for the applicant. EIRs were required for both the Circle S and the original Stagecoach applications. EIRs are currently being prepared for the new Stagecoach application and the Orin Swift proposal. An EIR is also being prepared for Walt Ranch. We are reviewing the appropriate level of CEQA review for Hendrickson. The General Plan anticipated that 12,500 acres of new vineyards would be planted between 2005 and 2030. At this point in time, based on a straight-line projection, the County should have approved 5,000 acres. To date, the County has approved 3,587 new acres of vineyards. This isn�t offered to justify the approval of any pending applications, only to note that overall vineyard development across the County is running less than expected. Currently, the County has about 1,000 acres of proposed vineyard pending. What activity that is occurring, however, is somewhat concentrated in the Rector watershed. Impacts to both surface water and ground water supplies are required to be evaluated in any EIR, as are cumulative impacts. The County is very aware of the broader implications of vineyards expanding within the hillside areas and are thoroughly looking at each proposal for its potential impacts. I would be glad to speak with you further about this and other concerns. If you have any questions or have information to share with us that sheds light on potential issues, please feel free to share them with us. Bill, thanks for copying me on this email. I have forwarded to Town Manager for further discussion. I also plan to contact Supervisors as they consider the APAC recommendations on Dec. 8. As Rector is Yountville's primary water source, I appreciate the information. While others will probably take on the water threats to Rector reservoir, my concern with further conversion is in the additional traffic that it will generate on the road. The residents of SCR are now in continuous battle mode with the new and potential wineries on the road and a key issue is traffic (as it is everywhere in the county). So far the largest traffic impact on the road has been from the vineyard development and we are now up to a 30-50 car caravan filled with vineyard workers each afternoon, and the occasional heavy equipment and trucks. (Most of us aren't up when the crews arrive in the morning). If the 200+ acres are added it will mean just that many more opportunities for an accident and a somewhat longer line up at the Trail trying to make that hair-raising LOS F left turn. If these conversions are going to be allowed, is it time to begin explorating the feasibility and practicality of shuttles as a way to move workers to the vineyards. Do such shuttles already exist in the valley? Have they ever been considered as a potential to reduce traffic county wide? In the case of SCR I'm not sure whether 50 cars are any safer than 5 large buses but perhaps the idea needs to be broached. One of many fanciful solutions (briefly mentioned on the SCR website solutions page here) are airport parking structures with shuttles for workers and tourists throughout the county. In a recent email to Mr. McDowell (I will send you a copy) I raised another issue about development concentration at the other end of Soda Canyon Road. My screed on it is here. It was triggered by the upcoming Reynolds winery request and I began to envision what the approved and pending winery use permits might mean for that chunk of the Trail. As you mentioned, looking at the cumulative impacts in a graphic form presents a perspective that is often lost in the scrutiny of individual projects even if cumulative impacts are discussed in reports. Cumulative impacts in reports, of course, never seem to consider what might occur if all adjacent properties are allowed to develop in a manner similar to the application. The area of the Trail at the bottom of SCR is beginning to approach buildout and I would argue that the winery strip mall, already a feature of certain stretches of Hwy 29 is now a possibility on the Trail as well. It is evident that it may be more logical to have 3 lanes along this entire stretch rather than a series of left turn bumps. Either scenario, while perhaps somewhat safer, is a clear sign that the fate of the Trail, given continued winery development, will ultimately be no different than Hwy 29. And that is a tragedy. As I mentioned in the screed, cruising the Trail is the time and place where the iconic, even mythic, character of the Napa Valley becomes visible for most residents and visitors alike. Is it not time to consider the views from the Trail as a scenic resource more important to the future of the county than the tourist dollars generated by the wineries and signs and "art" that will obscure the view? It needs much more protection than the General Plan, setback and viewshed ordinances currently give it. Forgive me for rambling on here. As you said, I feel these to be serious issues and they are becoming more and more observable. No apologies necessary. I can see how my comments may have been interpreted in that manner. For the record, I agree that the issue of when public art becomes a part of commercial branding is a valid concern. However, I am also familiar with the challenges involved in regulating First Amendment speech. The Supreme Court has ruled on this kind of issue numerous times, clearly stating that regulating the content of speech may be allowed only when narrowly tailored to serve a compelling state interest. That sets a very high bar for government when it seeks to limit what people can say and how they say it. While I understand the sentiments and concerns regarding the use of iconic art in a commercial setting, I can�t in good faith recommend to the Commission or the Board of Supervisors a course of action that would not stand in court and would result in public tax dollars paying attorney�s costs for the ACLU or other prevailing parties. Certainly a more equitable approach would be, as you suggest, to prohibit all structures within 600 feet of certain roads (possibly with exceptions for gates, fences, water wells, etc.). Then private art would not be singled out for discrimination. And you would have to take into consideration structures that are already within the setback. Would additions be allowed? My guess is that expanding the restriction, both to include a greater range of buildings and to include more roadways, would create a great deal of concern from affected landowners. Another approach, as staff has suggested to the Commission, would be to adopt design standards. While standards could not regulate content, they could provide a vehicle for the community to agree on what the rural landscape should generally look like. The policies regarding scenic highways are found in the Community Character Element, not the Circulation Element. You may want to talk with the Board of Supervisors to see if there would be any support in providing staff with that direction. Thank you for sharing your thoughts. I hope you find this information useful. I am glad you reviewed the list and discovered the proposed stress on Rector Watershed, so it made me happy to have gained the data from David, yet sad as to the degree. I had no intention of ruining your turkey dinner on Thursday.l Perhaps a stiff whiskey might help with the merriment. YET this brings to mind something that was achieved with Walt and Davis. We were able to involve the municipal entities that rely on the watersheds for their resident's drinking water: Napa City and St Helena.. In this case I would highly recommend some consultation with Yountville and the Dept of Veteran Affairs (Veterans Home) concerning these projects that might impact their water source. I would suggest contacting John Dunbar and the Yountville town council to alert them to the possibility of future erosion. A caveat: Yountville holds a contract with the Dept of Veteran Affairs to supply the town with 500 acre feet of water per year, drawn from the Rector Reservoir. They certainly are a stakeholder that depends on this water source and any reduction in water supply would require the town to increase use of their Groundwater via town wells. This very fact would provoke a reaction from the Farm Bureau that was very active in comments to the town council when the well/wells were proposed. Check the Register articles for the timing. The Department of Veterans Affairs is a different kettle of fish. I only have contacts for the maintenance dept at their facility, and I think you need contacts within the Sacrament Office. You and I started research into the dates of a previous ECP failure that fouled Rector Reservoir (from Stagecoach Vineyards ???? Middle 90's??). This erosion damage was on a par with Bell Canyon and the Viader Vineyards (David Abreu). The filters @ Rector were destroyed by the silt fouling and a new filter system had to be installed ($$$ unknown). Rector Water flows through the Vets Home and Yountville and into the sewage treatment plant that provide tertiary treatment for the water, which they then use to water their golf course, AND sell recycled water via a pipeline that reaches all the way to Silverado Trail and Chimney Rock Winery, with many vineyards along the way. CRW used to have a golf course that needed the water, but vineyards have replaced that demand. So any loss in sewerage volume as a result of Rector failure, diminishes a contracted recycled revenue stream (they also sell water for trucking at the plant (inside the golf course). There certainly more ramifications then mentioned that enterprising others will contemplate. Let me know How I can Help with teamwork and information. 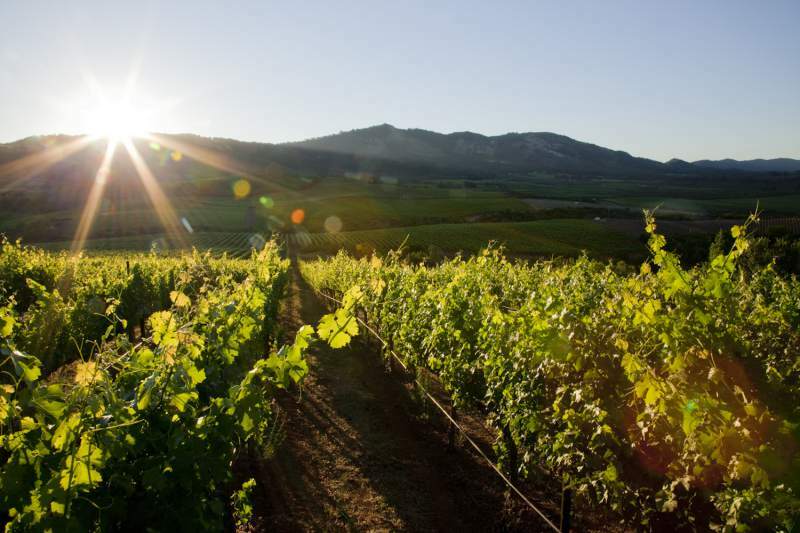 St. Helena reached out to Napa for its report. It's using those findings to resist the same policy that would allow further degradation of its own sensitive watershed. Prior to close of comments, and with our encouragement, the City of Napa wrote letters to the County strongly opposing WALT and Kongsgaard. St. Helena did the same in opposition to Davis. We had multiple meetings with Napa Vice Mayor Sedgely and St. Helena Mayor Galbraith. You might talk with Mayor Dunbar and point him to those gentlemen. 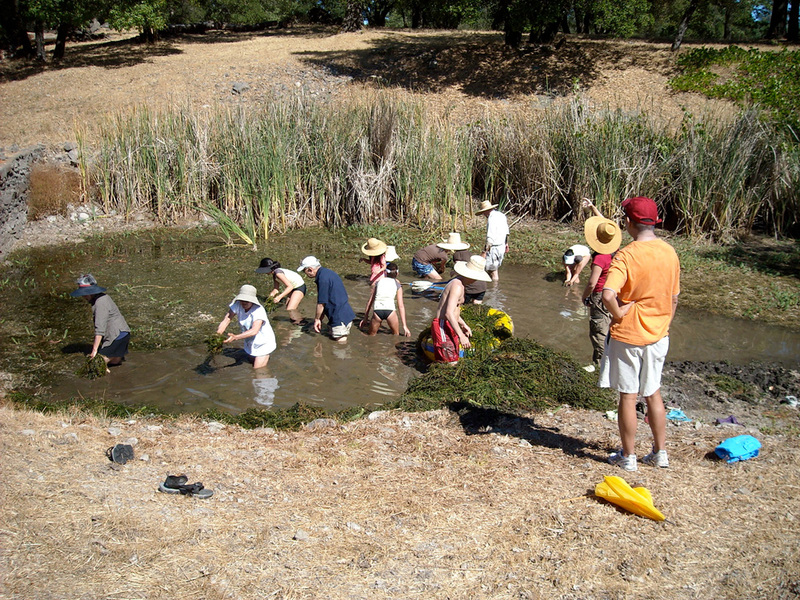 Find a water user (rate payer) in Yountville to join in. Scott Sedgley has been especially helpful in champing our cause. Interesting how the 60% tree canopy and 40% understory retention plays out in the Conservation Regulation/ordinance to �protect sensitive watershed' or municipal watersheds��this is Rector watershed above the Rector Reservoir. At a minimum we use Rector as an example of 60% 40% that resulted in this bad outcome. How about a LTE discussing this data to Yountville and Napa papers. I also think the data about the production and visitation numbers in the pipeline will shock people and needs an LTE also. Great points Ginna, maybe you, me and Bill Hocker can divide up the issues for individual LTE's.� Any recommendations for other writers? ?� Any recommendations on other topics of discussion? 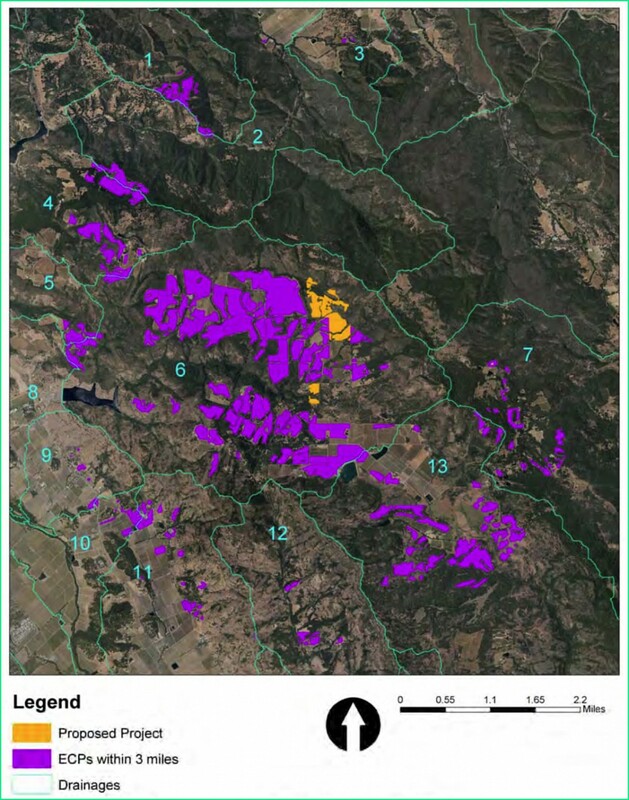 2.� The % of land in the watershed used for vineyards and the state of the vegetation in the watershed. �(60% tree canopy and 40% understory retention�required).� With the reduction in canopy and the addition of vineyards, how does this change affect the ability of the vegetation to filter and retain the soils and minerals on the hillsides and out of the water reservoir.� In other words, how is this new vineyard activity�changing�the mineral and chemical content of the Reservoir Water. 3.� Fertilizers and other Ag chemicals used in the vineyards and watershed that have the potential to migrate into Rector Reservoir and the drinking water supplies of Yountville and the CA Veterans Home. �(In other words, What is in your Drinking Water and are the residents acting as filters for the runoff from the vineyards?). 4.� Erosion into the Reservoir that is reducing the amount of available storage and the ability of the existing filters to remove the impurities in #3 & #4.� What are the infrastructural costs as a result of the vineyards installation. (Water Rates in Yountville). 5.� As a result of the Erosion Blowout in the 1990's that fouled Rector Reservoir and forced a new filter installation, did the Vineyards pay for this damage to repair the infrastructure?� Did they admit their failure to keep their soils on their property as defined by the ECP's, and pay for the damage?� Or did they blame the county for a failed ECP process? 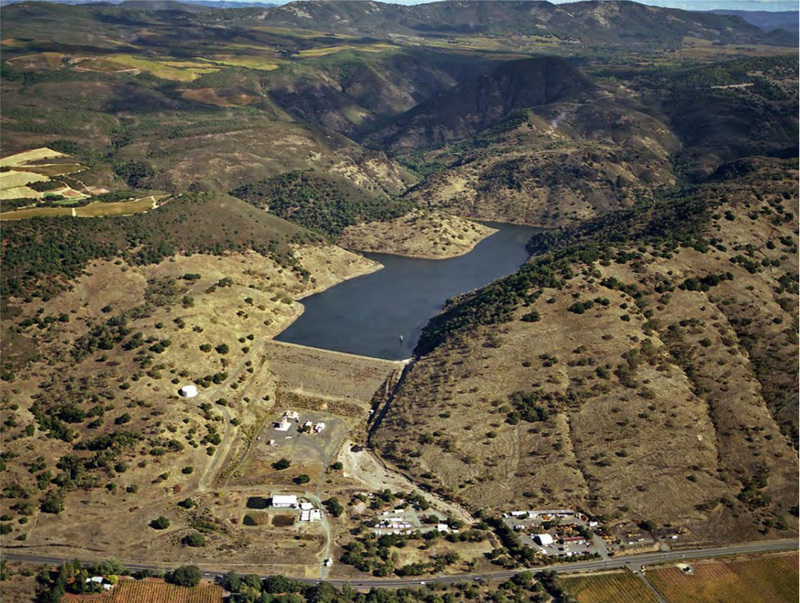 Also� Rector Reservoir is reputed to be out of compliance with Section 5937, the CA law which mandates the bypassing of water behind dams for fisheries. With cities like Calistoga and Los Angeles losing legal challenges to this, it is only a matter of time until Rector (and other non-compliant dams) are targeted as well. I read the entire SCRoad.org update and noticed that you sent email to Planning Director and stated that Chopping land was the last or only larger tract not yet proposed for vineyard dev. 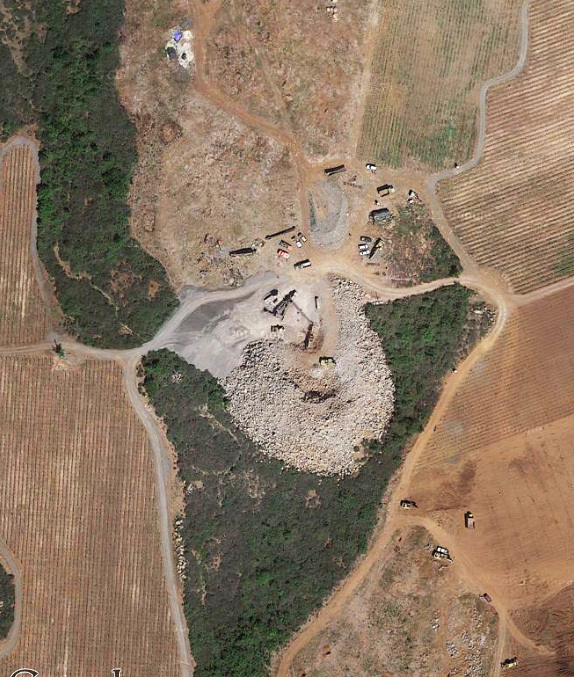 Portions of our land have been cleared, ripped, rocks removed, and planted with olive trees (2 groves, approx. 150 trees/ 2 acres). almond orchard (approx. 1 acre) plus approx. 8 acres of pasture/crop land. Also, we planted a walnut orchard (approx. 1 acre), altho that was not ripped and was not successful. So our land has had development for ag uses./ We have tried to prevent soil erosion and always take measures to minimize or prevent erosion when we do any land work and we have watched winter runnoff to be sure we have no problems. . This year we expect much more erosion than normal due to extensive rooting that has occurred by wild pigs and is beyond our control. We support sound agricultural practices. We are experiencing a die-off of native pine trees, likely caused by beetles. We are seeing an increased loss of oak trees due to damage in past fires and perhaps the current drought. We have been seeing a dying of manzanita, cause unknown but I suspect a bug or disease. We have never had manzanita dying prior to about 2000.